Utah’s starting power forward is back. Derrick Favors and the Jazz have agreed in principle on the terms of a two-year deal, league sources told The Salt Lake Tribune on Monday morning. Favors will receive $18 million per season under the terms of the new contract, according to sources. The first year is guaranteed. The second is not. Favors, who was an unrestricted free agent for the first time in his career, will travel to Utah from his Atlanta home to sign his contract later in the week. “It feels great. We have some unfinished business to settle. We have good team, and we are going to be good for a while,” Favors told The Salt Lake Tribune on Monday afternoon. Jazz general manager Dennis Lindsey, coach Quin Snyder and assistant Tony Lang traveled to Atlanta to meet with Favors on Sunday, where the Jazz tendered an offer. During the meeting, Favors and the Jazz talked about his potential fit going forward, something Favors had a bit of concern with. However, Favors also knows, sources say, that the Jazz project to be a deep team next season and only Donovan Mitchell and Rudy Gobert are guaranteed heavy minutes. Favors endeared himself to the Jazz this past season because of an ability to accept a role. He became a locker room leader, and turned himself into a fantastic backup center and even started to hit a few 3-pointers down the stretch. It did take Favors some time to acclimate himself to the role the Jazz wanted him to play. Once he did, though, he was able to make himself a valuable piece, instead of the square peg in the round hole he had been at times the previous season. Favors’ crowning moment came in the first round of the playoffs in a win against the Oklahoma City Thunder. His defense on OKC star Carmelo Anthony proved critical. He scored 20 points and grabbed 16 rebounds in a Game 2 win — the game that tilted the series in Utah’s favor. And he hit several big shots in several games to help the Jazz beat the Thunder in six games. 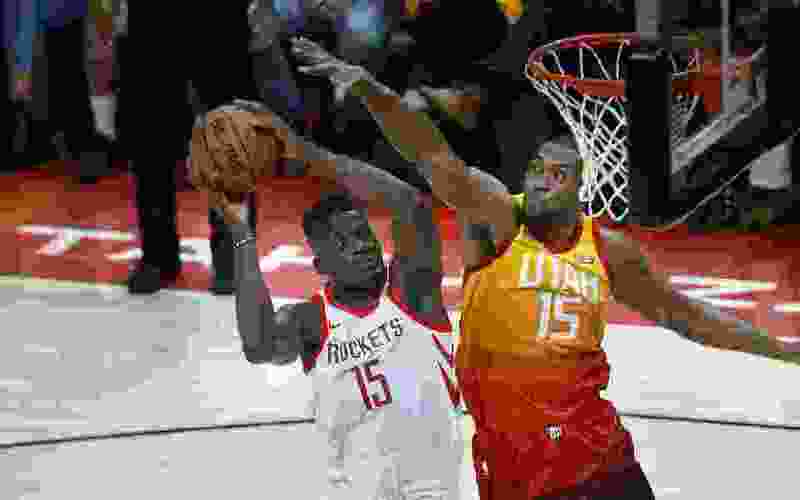 The Jazz pored over endless film at the end of the season, according to sources, analyzing the fit with Favors and Gobert. Here’s what they found: The Jazz aren’t a perfect shooting team with the two on the floor, but they are one of the most unique defensive teams in the league when they share the floor. Over the last 38 games of the season, the Jazz had the best net rating in the NBA. Sources say the Jazz believe much of that is due to Favors and Gobert. And it can be argued the Jazz don’t beat the Los Angeles Clippers two seasons ago in the playoffs or the Thunder in this past playoff without Favors’ contributions. So, when it came time to negotiate, the Jazz wanted to reward his value, his internal sacrifice and his value in the locker room. In that sense, the contract turned into a win for both sides. Favors, who wanted to cash in on his third contract, gets a hefty payday. The Jazz get to keep their salary cap clean for next summer, when they can clear space for a max salary contract in one of the most anticipated free agent classes in recent memory. Plus, Lindsey saw value in bringing his roster back intact. With Favors in the fold, sources say the Jazz are turning their attention to point guard Dante Exum, and third point guard Raul Neto, the latter of whom the Jazz met with on Monday, according to league sources. Favors, sources say, knows he will have a chance to return to the free agency market when he will be 28 and in his prime. He’s lost weight since the end of the season because he wants to be leaner, quicker and more able to guard opponents on the perimeter. For now, Utah’s longest tenured player remains in the fold.